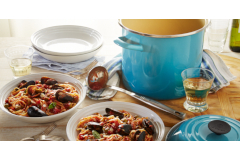 Le Creuset stockpots heat rapidly and uniformly for slow simmering and their lids seal the flavorful bouquet of your culinary creations. The steel rims prevent chipping and the enamel interior won't absorb odors or flavors. Tight fitting lids help seal in heat and flavors. Enamel on steel construction makes them easy to lift and pour. Stainless steel rim on base and lid prevents chips and cracks. Performs on all heat sources - gas, electric, induction, and ceramic top. Enameled interiors are easy to clean and will not absorb odors or flavors. Classic styling with heavy-duty performance. Le Creuset Enamel on Steel offers superior Le Creuset craftsmanship in heavy-gauge steel. Glazed with hard, glossy enamel, these Stockpots feature the same vibrant colors as Le Creuset Enameled Cast Iron cookware. Constructed from heavy-gauge carbon steel with a durable and colorful porcelain enamel finish. Refrigerator-, freezer-, oven-, and dishwasher-safe. Convenient quick heating and superior heat distribution. A stainless steel rim around the top edge prevents chipping and cracking. Easy-to-clean interior resists flavor absorption and staining. Heat-resistant phenolic knobs stay cool to the touch for safe, secure handling. Can be used on any heat source (gas, electric, induction, ceramic). Dishwasher-safe, but hand washing recommended. If enamel interior gets stained, soak overnight in mixture of 1 tablespoon of bleach and 1 gallon of water. Avoid using harsh detergents, abrasive cleaner or steel wool or steel scouring pads. While I was impressed with the speed with which I received my order, unfortunately, it was damaged/defective. The enamel on my Le Cruset 8 qt. stock pot was chipped on both handles. Too bad. I already own one of these and use it so often, I wanted a second one, but for almost $80 I expected it to be in new/perfect condition. Returned. However, the Cook's Warehouse customer service was excellent, and the return was easy.